Marina was born in Southern Anatolia, specifically from Pisidia in Antioch, at the end of the third century during the reign of Claudius II (268-270). She was the only daughter of noble pagan parents. When she was five years old her mother died (some sources say she died shortly after childbirth), and since her father, Aidesios, was too busy carrying out his duties as a pagan priest to care for her properly, he turned her care over to a woman who happened to be a Christian. This nanny lived in a small town about fifteen miles from where Marina was born. Away from her father’s idols and blasphemous practices her nanny taught her about the Christian Faith. As Marina increased in age, more so did she advance in knowledge, understanding, and compassion. Her faith in the Living God was so great that she desired the difficult path of Martyrdom. She told her father that she wished to become a Christian and to never marry so as to live a life of virginity. Her father despised her for her faith and disowned her as his daughter. A new governor named Olymbrios was elected for the region and in time began a persecution against all Christians in the area. One day he caught a glimpse of the very beautiful fifteen year old Marina with her nanny. The Imperial Governor Olymbrios, seeing her great beauty, desired her for his wife. When asked her name, homeland, and faith, Marina answered: "My name is Marina; I am the offspring of Pisidia; I call upon the Name of my Lord Jesus Christ." Upon learning that she was a Christian, Olymbrios tried to dissuade her by flatteries, and by threats of torture. "Nothing Will Separate Me From Christ"
Marina frankly replied to the man: "Have no vain hope for me, O governor, that I might cower before any number of torments. Nothing will separate me from Christ - neither affliction, famine, fire, sword, nor any other harsh tribulation - not even a violent and very painful death. Think not that you will entice me with honors, gold or other wealth, because all these things are perishable and temporal. "The soul, by the grace of God, is immortal and desires eternity. For this reason, we, the Christians, wisely disdain these fleeting luxuries and enjoyments. We endure the sorrow and distress of the day that we might attain to everlasting life and eternal rest after our repose. If you think that I lie, here I am, try me, so you will know by deed the truth. Strike me, slay me, burn me, suffocate or test me with ten thousand torments. As much as you will worsen the punishment, so much more will Christ glorify me in the future life and blessedness. "Many times in this life Christ grants us a small consolation as a pledge of that future exaltation. He draws us out of the depths of the sea, or rescues us from fire, or saves us from other torments, to your shame and condemnation. Therefore, I do not sorrow in this transient life. Readily I give my body to death, for my deathless God and Master, as the Sinless One, out of love for me, was crucified." This rejection infuriated the governor and he put her to harsh torture so all the beauty of her body was disfigured. Not only the public sorrowed and wept and suffered due to her troubles but even the governor himself, unable to bear the horror of these tortures, hid his face in his hands. As broken up and destroyed as her body was, more so was her soul renewed and brighter. "Great Is Your Faith, Marina"
Unshaken, she prayed with thanksgiving that the Lord count her worthy to be tormented for His love. As they tortured her, the Saint was looking up to heaven, and prayed: "To You, O Lord, I lift up my soul. O My God, I trust in you; let me not be ashamed; let not my enemies triumph over me. Indeed, let no one who waits on you be ashamed. Let those be ashamed who deal treacherously without cause. Show me your ways, O Lord. Teach me your paths. Lead me in your truth and teach me, for You are the God of my salvation. On You I wait all day. Remember, O Lord, Your tender mercies and Your loving kindnesses, for they have been from of old. For I withstand these pains because I confess Your holy name. Send Your mercy and compassion to me so my grief will become joy." As the Saint was chanting and praising the Lord, the soldiers were beating her so severely that her flesh was torn and her blood flew profusely. The Archangel Michael, then, appeared to her and said to her: "Great is your faith, Marina. Have more strength, for it is by your good confession that your soul will survive, and you will gain the holy baptism." The ruler was enraged. He ordered to saw her flesh with iron saws, and to cut her skin with knives. When he thought that she was dead, he ordered his soldiers to put her body back in prison until she rotted. Archangel Michael appeared to her again, strengthened her, and repeated what he said to her before. He, then, Crossed her, cured her and disappeared. A malicious demon, beholding that his servant, Olymbrios, could not vanquish one young woman and make her fall down before the idols of demons, became desperate and wished to test her himself. Taking on a dark and dragon-like guise, a demon appeared to Marina in the prison to frighten her. Fearlessly Christ's athlete seized him by the hair and, finding a hammer, beat him to the ground, completely humbling him. A great light appeared and illuminated the entire prison. All of Marina's wounds were completely healed and not even a trace of scarring remained on her body. 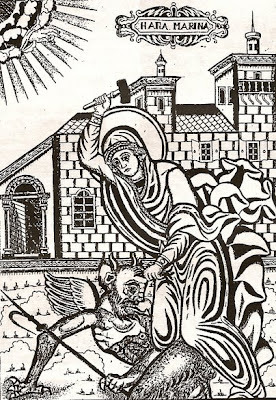 It is for this reason that Saint Marina often holds a hammer and is sometimes depicted beating on a demon in her icons. The demented governor tortured her the next day by fire and water but Marina endured it all as if not in her own body. The ruler gave his orders to tie her to a pole and burn her. They did. Then he ordered that they tie her hands and legs, and put her in boiling water. When she was in the water, St. Marina looked up to heaven and said: "O God who dwells in heaven, I ask You to untie me, and to make this water a baptism for me. Dress me with the robe of salvation through it. Take away from me the old man and put on me the new man. Make me, with this baptism, worthy to inherit the life eternal, and make my faith steadfast.” A great earthquake then shook the place, Marina’s ties were loosened, and she immersed herself in the water three times in the name of the Father, the Son and the Holy Spirit. She came out of the water praising God. A voice came from heaven, and all the people who were gathered there heard it. The voice said: ”You are blessed, Marina. You were baptized, and became worthy of the crown of virginity.” Many of those who witnessed these events declared their faith, became Christians and were baptized. The ruler ordered all of them to be killed. They were beheaded, and gained the wreath of martyrdom. It is estimated that they numbered in the thousands. Seeing that he could not overcome the Saint, the wicked governor finally sentenced Marina to death by beheading. She was beheaded at the age of fifteen in the time of Diocletian (284-305), but is numbered with the armies of martyrs, and remains alive in soul and power in heaven and on earth. The sufferings of the Great Martyr Marina were described by an eyewitness of the event, named Theotimos. Up until the taking of Constantinople by Western crusaders in the year 1204, the relics of the Great Martyr Marina were in the Panteponteia Monastery. According to other sources, they were located in Antioch until the year 908 and from there transferred to Italy. Now they are in Athens, in a church dedicated to the holy Virgin Martyr. 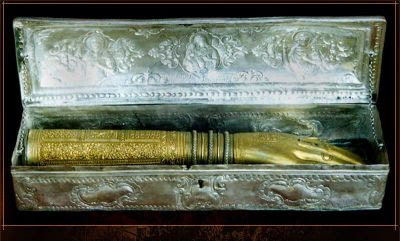 Her venerable right hand was transferred to Mount Athos, to the Vatopaidi monastery. However, atop Mt. Langa in Albania overlooking Lake Ochrid, there is a monastery dedicated to St. Marina with a portion of her miraculous relics. Countless miracles have occurred and still occur in this monastery, whose witnesses are not only Christians but many Muslims as well. So much did the Turks have respect for this holy place that they never dared disturb either this holy place or the property of this monastery. At one time a Turk was the guardian of the monastery. Saint Marina is especially invoked for deliverance from demonic possession and cures innumerable diseases including cancer. What a role model for Orthodox Christian young women today! This 15 year old girl was raised a pagan, had a mother that died when she was young, her father shunned her for accepting Christ and desiring virginity, she rejected a life of marital happiness and love to live for Christ and abide in His love, she further rejected all the fame and fortune and worldly comforts associated with nobility, for her strong resolve in following Christ she was tortured brutally, she endured a demonic manifestation and temptations courageously, and finally she was tortured and martyred ruthlessly yet with a joyful heart with a desire to imitate the Saints. Most teenagers today would probably find the early tragedies of Marina's life demoralizing, but her love for Christ overcame all her insecurities and strengthened her against all the temptations every teenage girl faces. She could have lived any type of life she wanted, but she chose a path that brought her supreme joy that no worldly happiness could ever surpass. And now Saint Marina lives forever and is one of Orthodoxy's most powerful and beloved Saints. She still answers prayers, cures illnesses by the grace she received in enduring bravely for Christ, and is a notable vanquisher of demons. Saint Marina was no damsel in distress, but a true female heroine. 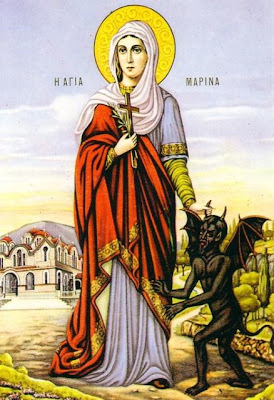 Before there was a Hollywood female heroine, there was Saint Marina the Vanquisher of Demons. Those are fiction, but her story is real and her miraculous icons and relics are a testimony to this besides her many visitations to the faithful. Her superpower was her faith and the grace of the Holy Spirit. There could be no better female teenage role model, as she herself imitated the Theotokos and Ever-Virgin Mary who it is said also bore Christ at the age Saint Marina was martyred. Maybe most young women won't have to go to such extreme tortures for their faith, but to be a faithful Christian in our society today will innevitably invite public ridicule, peer pressure, misunderstanding, unflattering stereotypes, insults and all sorts of temptations. Even in the midst of these types of "tortures", the example of Saint Marina can be a model on how to courageously endure and be strong. Young Marina's confident faith and great love for God should serve as an inspiration to look beyond all vanity of this life and focus on that which truly matters. O Glorious Marina, once betrothed to the Logos, you relinquished all worldly concerns and brilliantly gave struggle as a virginal beauty. You soundly trounced the invisible enemy who appeared to you, O Champion, and you are now the world's wellspring of healing grace. Adorned with the beauty of Purity, O Virgin; crowned with the stigmata of martyrdom; stained with the blood of your struggles; and brilliantly radiant with healing wonders, piously, O Marina, you received the trophy of victory for your struggles. The life of Saint Marina in Greek with beautiful icons is at a wonderful website dedicated to Saint Marina found here (http://www.agia-marina.org/). It is all in Greek, but has her complete Supplication Service, many icons, and information on churches dedicated to St. Marina.